I received a complimentary e-copy of this book from the author (thank you!) in exchange for my honest review. These opinions are entirely my own. Ever since reading THE WORD CHANGERS, I have been waiting breathlessly for another tale from talented authoress Ashlee Willis. That wait is now over. I was overcome with excitement to begin reading this novella, but at the same time, feared being disappointed after my high expectations. I need not have worried. 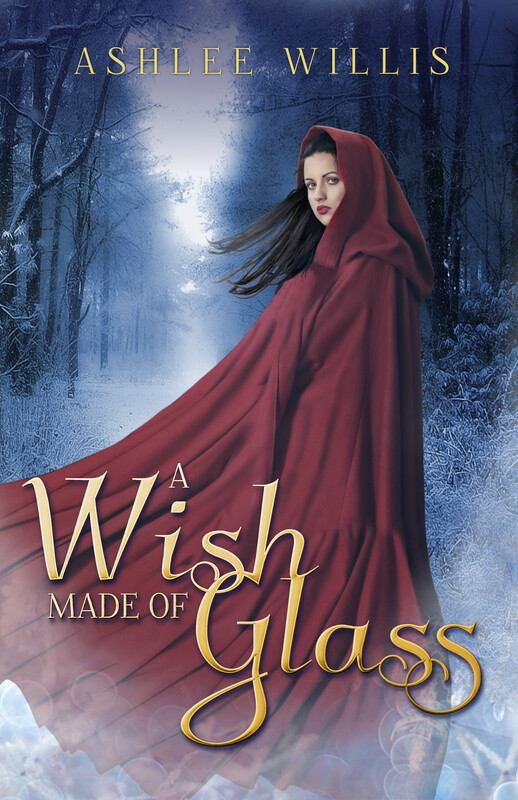 A WISH MADE OF GLASS blew me away with its gorgeousness, not only meeting but in fact far, far exceeding my expectations. 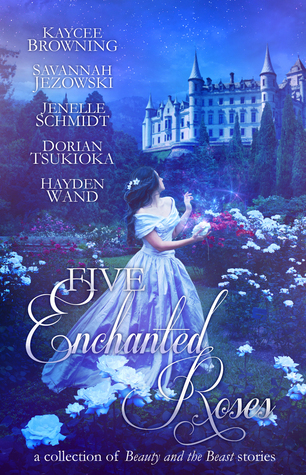 It is loosely based on the Cinderella fairy tale, and it is written in first-person present-tense, which is a mode of writing that irks me, but I grew used to it in this story almost at once and could not begrudge it, which is saying something. From the very first, I was entirely enchanted and drawn inescapably into this story and this world, a fey and beautiful one, the beauty starker against the shadows. The writing held me spellbound, the words spun together like the silver threads of moonlight and wishes. I can describe it in no other way than to say that it felt like a fairytale. The whole tale was quietly beautiful. It held many surprises and was not at all what I expected. This is not a light tale. There is darkness and sadness and the bittersweetness of families and friendships found and broken and found again, and missed chances heartbreakingly forever lost. The story holds all the darkest emotions that can be found, poisonous and treacherous, in the lightless corners of one’s own heart. The heroine is flawed, as all people are. Sometimes it was very hard to read about, and could, I think, easily have made me dislike the story, and yet somehow it did not. And to find the joy and light was well worth it. It makes one think, perhaps, of one’s own failings and beginning to think of letting a light shine into the shadowed corner. The characters were quite real. Isidore’s sorrow and struggles and innermost thoughts were well-painted. Blessing was an interesting character, the stepsister who is kindhearted but has her own things to wrestle with as well. Young Lord Auren made a surprisingly vivid short appearance and I basically loved him. My favorite character is of course a certain mysterious fey, whose name I realized at the end, with some surprise, we had never learned, and yet decided that it was perfect. Characters like that totally fulfill my reading wish in any book. The visuals are stunning. I loved the turning seasons and the dresses and cloaks and the ball, but especially the snow and the fey wood and the fey themselves, and I want to join in their dance. I wish there had been more with the fey in the story. You feel in the end a little as if there are hinted truths threaded through beneath the surface of the tale that you can not quite grasp. At least, that is how I felt. There is something deeper, elusive, and you feel that maybe one day you will understand it, even if you do not right now. But in my experience, the best books are like that. I adored this quick read and it pulled me completely into a world of rich color and magic and snow and fey dances in the forest. I enjoyed it so very very much. If you have a hankering for an enchanting tale of light and shadows, a fairy tale in its truest form, a beautiful world with characters who come to life and wrestle with their own darkness, told in words as natural and beautiful as flowing water under starlight, A WISH MADE OF GLASS will be your own wish come true. Ashlee Willis lives in the heart of Missouri with her husband, young son, and simply way too many cats. 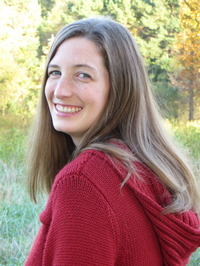 While most of her days are balanced between writing, reading and homeschooling, she also loves to crochet, play the piano, and spend time outdoors in God’s creation. I received an e-copy of this book from the author in return from my honest review; I was not required to be positive; these opinions are entirely my own. As the sequel to BROKEN GLASS (found in the FIVE GLASS SLIPPERS anthology), I was so excited to read CORRODED THORNS to experience the rest of Darcy’s story! And boy does it ever not disappoint! I loved this book so much that I read it twice in one week. I have an occasional urge to do that with other books, but almost never follow through. But this time I just couldn’t help myself! Fortunately it’s a novella so I was able to read it in a sitting, and it’s one of those perfect novellas that feels exactly the right size. As a Beauty and the Beast retelling, I so enjoyed watching the plot unfold and picking out the similarities and twists. It’s a favorite fairytale of mine, particularly that it shows how even really horrid characters can find redemption. 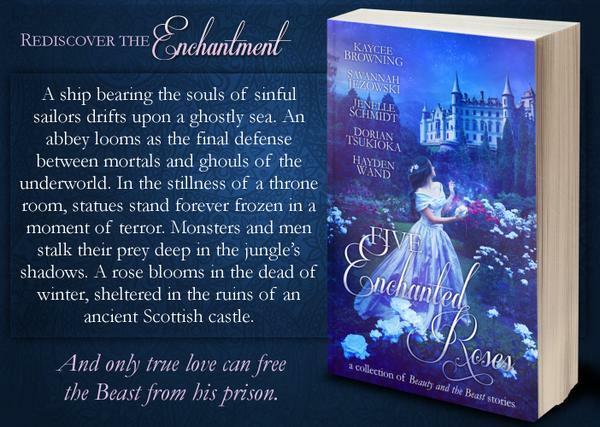 I LOVE fairytale retellings, and this has to be one of my favorite versions of Beauty and the Beast! I simply adored it. The plot behind the normal Beauty and the Beast part of the story was so awesome — I loved that there was so much more going on under the surface than meets the eye and it TOTALLY made sense for the story; plus, fascinating fairy godmother politics! Isn’t that just cool? It was all so interesting to read about! 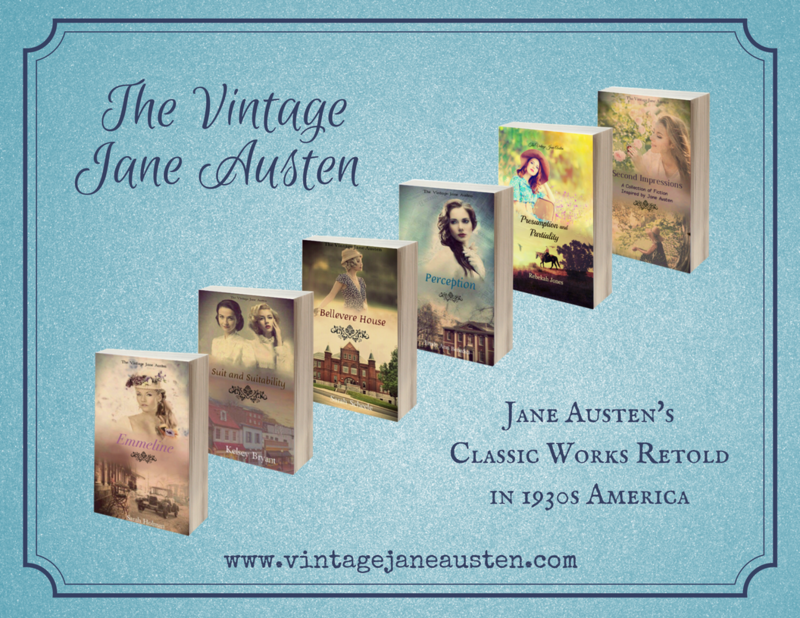 It was a gorgeous world, the settings felt so alive and real and everything was extremely vivid in my mind, despite the relative shortness of the tale. I really felt like I was in that old dark castle on the lake! The touch of steampunkness was SO cool and original (steampunk Beauty and the Beast? Yes please! ), and I don’t usually notice this but I LOVED the magic in this story! It was just… I can’t describe it but it was perfect and seamless and interesting. Just… really well done. In the interests of being fair and looking at both sides… Complaints? Umm, it took me a moment to think of any. There’s hardly anything wrong with this book! I did sometimes have a hard time visualizing exactly what the Beast looked like. I wished there had been a little more description on that, since my mental image kept changing. That being said, it was still an extremely awesome idea the way he was done! At first as I started out, I was slightly disappointed that it didn’t feel just like the first one, BROKEN GLASS, which was hilarious and mad-dash and there were so many characters running around making a mess and being fabulous. But that’s only a partial complaint, because I quickly grew to love CORRODED THORNS just as much, despite its different feeling, and perhaps more because this one was much more straightforward of a plot, mostly following the one storyline, so I ended up more invested and just loved watching Darcy and Madeline’s story unfolding! So don’t expect CORRODED THORNS to have exactly the same feel as BROKEN GLASS. This one is a little less whimsical and has a darker, more serious and epic feel to it (but there are still fabulous characters and some hilarious parts, never fear!). But I ended up loving that about it. They’re just different stories but you can still feel that they’re connected as well. And now we get to the best part. The characters! I LOVED THEM. Young Niles was an unexpected but splendid (and rather important) addition, the one servant who stayed behind for the Beast. Gaahh, I just adored him! He was such an original, cheerful, stubborn, friendly fellow and was just fabulous! Yes, yes and yes. His role in the story really surprised me and I thought it was so cool! Darcy… Ah, Darcy. What does one even say about him? DARCY. That is all. Despite his somewhat beastly tendencies, you still love him and it’s just incredible watching his story-arc leading from BROKEN GLASS and progressing through this one. It was amazing to read about, quite believable, awesome, and extremely well done. DARCY IS MY FAVORITE. I just loved loved loved reading this story about him! Especially his snark. So much fun. Darcy, Niles, and Madeline make for a splendid main cast. Their interactions are just the best! The humor, the gems of hilarious lines… I loved it all! The other characters were interesting as well. Basically look forward to a great cast of characters in this book. The ending. THE ENDING! There was one of those moments near the end where I suddenly stopped reading and went oh no — it’s about to be over — I don’t want it to END!! But then it stayed just the right extra amount of time to wrap up the things I wanted addressed and it felt… I don’t know… like a reward and it was just PERFECT! AAAHH. I loved it so much! Also, the glimpse of some characters from the first at the end totally made the book!! It made me so very very happy! Gaahh, how can I say enough wonderful things about this wonderful book? I feel like I’m falling woefully short! For such a small tale, it was packed to bursting with fabulousness. There was much incoherent squealing and babbling about its awesomeness on my part after finishing it. EEEK! ❤ And then I had to reread it only a few days later because I couldn’t help myself — I had to enjoy its loveliness again! Basically it was glorious, epic, funny and full of characters I loved a ton, plus a setting I was completely immersed in (I want to live there! ), and of course Beauty and the Beast! What more can you want? I adore it and love it to bits and it just made me indescribably happy! Emma Clifton has been thinking up stories before she knew how to type them out. Reading books such as the Chronicles of Narnia, The Door Within Trilogy, and Redwall inspired her to take her writing more seriously. 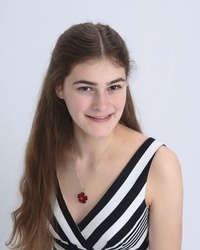 Though her rigorous homeschool education keeps her busy, she also enjoys sewing, reading, and spending time with her family in beautiful Northern Virginia.